At least Father’s day is special, still. Well here we are on a hot day up to 28C or about 82F sunny dry. it’s day that makes me think of my mother too, but at least I have my father. This is our day, it should be every day but we take at least one. To remember, think, enjoy the good things we have around us even if small. Today, I went out with the family all five of us, and my father =6, he is already 80 with a pharmacy of medicines but looking strong. We had a restaurant reserved in medieval nice Vannes at 1pm or 13h. 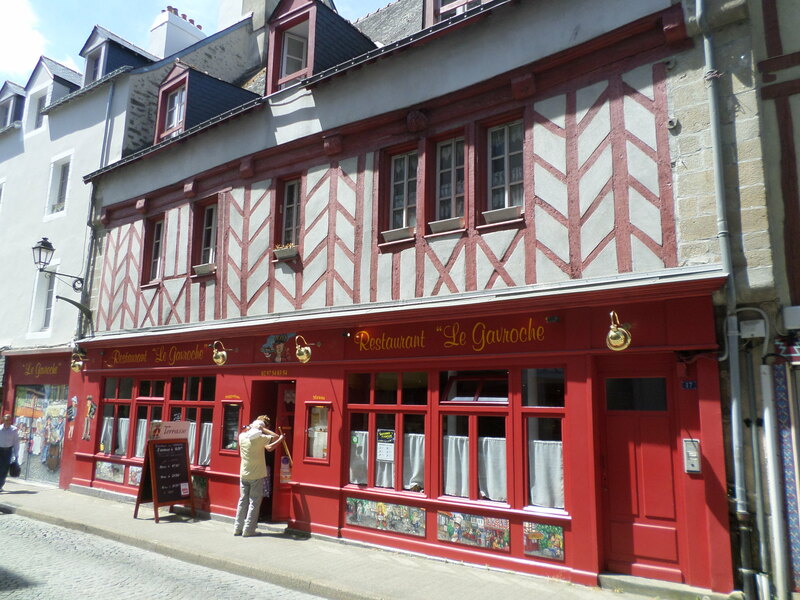 We set out from our house knowing that it was music festival day as well, Fête de la musique in France and Vannes had circulation limited in the center. So we gather our knowledge and went around it parking on boulevard de la paix and going into the old quarters of Saint Patern by rue de la Fontaine. Before the lunch, we had our walk around the area , always pleasant; noticing some new business like the Portuguese resto now has a grocery store just a couple houses away! Finally, it was time to go in, they already remember us!! It’s always a great thrill to be recognize when you patronize one of the local places here, very typical and nice we think. We had our table in the middle section so by now we have try it all front , terrace ,and middle. The whole place is painted by a local artist we will contact to make them do some work in our house too ::) Many dolls, and puppets and a great wines , and local liquors collection. The food of the day was pigs head so not our fancy ….we settle for the fish Dos de Colin with a herbal thai sauce(hake) in the menu for 17,90€ including a delicious entrée on goat cheese with tomatoes, and finish with a great rice pudding with caramel sauce. All with a porto rouge for apéro. We had a muscadet white wine from the Loire ,Chateau le Coing de Sainte Fiacré, and a expresso coffee to finish. All with excellent prompt service of breads, water, and change of utensils, perfect as always here. The rest had different things from steak with mashed potatoes, basque chicken in sauce, coca cola, aperitifs from vodka base to fruity non alcohol, More fish colin or hake, and ice cream from two to three scoops of different flavors all for 26,20€ per person. Happy Father’s day to all celebrating! Cheers , life is beautiful, la vie est belle.